Dear Jessi: Do we really need ALL that baby stuff? My husband and I just found out we’re expecting. Even though this wasn’t a planned event (we just got married two months ago), we’re very happy to be beginning our family. The problem is, we started looking around in baby departments and online and are overwhelmed by all the stuff a baby needs. We knew about the basics, like diapers, clothes and a crib, but we don’t think we’ll even be able to figure out what kind of bottles to pick. Beyond, the overwhelming amount of things we need, we’re just starting out, have a small, but comfortable apartment and have no nest egg to draw from. We’re starting to freak out here. The doctor says I’m 8 weeks along, how are we going to pull this off in seven months? Do we really need ALL that baby stuff? Take a deep breath….it’s all going to work out. Don’t panic. The short answer is, no, you don’t need all that stuff. Babies have basic needs, just as you mentioned. The other stuff is more for ease and comfort. Your remaining seven months will give you plenty of time to gather the essentials, especially if you’re always on the lookout for good deals and let people know what you need. A safe place to call home: Small comfortable apartments make happy homes, too. As long as it’s clean and safe, there’s no reason to hurry into a lease or mortgage you’re not financially ready for. Your little bundle doesn’t need his own bedroom just yet. In fact, you’ll probably want him in your room for the first several months, anyway. If you can fit his crib in there, you’re golden. It’s really the only major piece of furniture you’re going to need for your baby right now, anyway. Clothing: Onesies, jammies, a few outfits, and socks are the basics. Especially the onesies and jammies. Your baby will live in these badboys for the first few months. They’re simple and comfortable. Also if you live in an area where it gets chilly or cold you’ll need weather appropriate outerwear. Crib: Bassinets are elegant, but unnecessary, babies outgrow them in a few months. You’re better off investing in a crib from the get-go. There are some that even convert into a toddler bed and then serve as a head and footboard for a twin bed when the time comes. Bottles: Unless you are ABSOLUTELY positive you will be exclusively breastfeeding, you’ll want a bottle starter pack. You can discuss formulas with the nurse at the hospital or your baby’s pediatrician. 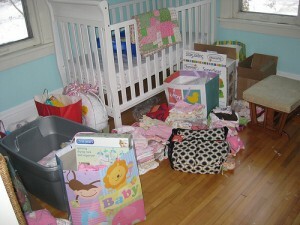 Receiving blankets and crib sheets: There’s no need to drop a bundle on a fancy-schmancy crib set, complete with quilt. Unless your baby is swaddled, you can’t even use a blanket to cover him in his crib at night. It’s a suffocation hazard. You’re better off with a stack of receiving blankets and a couple blanket sleepers. Cribs sheets should be well fitted to the mattress. Car seat: A good quality car seat is an absolute must. This is another place where it’s worthwhile to budget a little extra moola. After all, it’s the seat that will keep your most precious treasure safe. Investing in a car seat the converts into a high-backed, and then backless, booster will save you cash down the line, too. Diapers: Whether you choose disposable or cloth diapers, you’re going to need plenty. Stocking up before the little fella or lass joins your clan isn’t totally necessary, but will save you some stress and money down the line. Keep your eyes out for sales. Changing tables: You can change him just as easily on your bed, couch or on a clean blanket on the the floor. A fancy diaper bag: Those monster diaper bags with 100 bajillion pockets look mighty convenient, but they’re really not necessary. You can easily get by with a small diaper bag or large purse or duffel bag for long trips. Silly frills: Diaper warmers and mega mobiles are fun touches, but you won’t get a ton of mileage out of them. A ton of toys: Your baby won’t even play or take notice of toys for a few months. Don’t worry about them right away. Friends and family will get stuff, anyway. And they accumulate quickly. A swing or bouncy seat: While I suggest getting a simple bouncy seat that you can take around the house with you, you don’t need to spend a heap of dough on one or get a giant model that takes up a load of space. Don’t get so mixed up in how things will come together that you’re too panicked to enjoy your pregnancy. Relax. Things will come together. The people in your life know that the bun in your oven is a happy surprise, so they’ll ask if there’s anything you need or specific items you want them to mention on your baby shower invitations. Be honest. Let them know. Everything will be okay. Congratulations, mama! Ask Jessi: What are the Seat Belt and Car Seat Laws in My New State? Ask Jessi: Can I Take My Baby Black Friday Shopping?